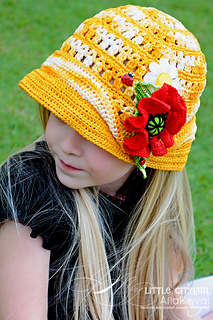 Such a sweet and feminine hat can be made in any color combination and is just perfect for a lady of any age. This hat would be a great addition for any Spring wardrobe, Easter or many other occasions. The hat features a detachable Poppy Brooch. Instructions for Poppy pin are included in this pattern.